One of my first logo design projects as a fresh-faced freelancer was for a security company called, ‘Target Investigation and Training Services’ – they needed a logo design quickly. But keen to make a good impression, I made the mistake of starting a logo design with only a basic brief and a rushed conversation from the client. When I presented my logo options, they were happy with all the designs presented and chose one. The next day I was at a breakfast networking event to do a talk on my logo design process, and I showed my current work. After a few giggles from the audience, I had to accept the revelation, and thank the audience member for pointing this out. We amended the logo to reflect this insight and the client was happy in the end. Before starting the logo design project, I should have found out more about their ideal customers, who their competitors were – but I never really questioned their company, their brand name or do any in-depth background research. If you’ve spent time creating a new product or service, it can be exciting – but it can also be harmful and ruin that first impression if you rush into launching it without preparing the brand. You want it to look professional in the eyes of your ideal customer. And investing in a good logo identity will make the overall brand messaging shine, giving you the confidence and assurance to sell it. From my experience, investing in your brand at the beginning will save you time and money later when you grow and have to rebrand again to make it right. There are stories of logos speedily sketched on a napkin or back of an envelope and yes, many famous logos that have been born this way – the Virgin logo is one of them. Virgin’s original logo featured two naked girls sitting with a dragon intertwined around a tree. It was agreed that the logo didn’t reflect the company’s future. The story goes that Richard Branson had asked a young designer in 1977 to his houseboat to talk about logo design options. 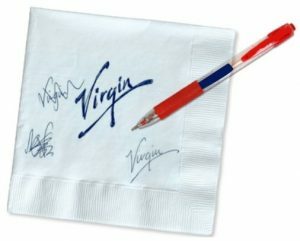 After a lengthy meeting with questions about his goals and ambitions for the company, the designer scribbled “Virgin” on a napkin and Branson immediately fell in love with its attitude, energy, and simplicity. But this is only half the story – the designer had previously done a lot of research on Virgin beforehand. He asked lots of questions in the meeting. And over the years the logo has been tweaked and refined, becoming the iconic, visual brand mark of their whole company. I have found over the years working as a brand and logo designer that you need to have a system for any client service clearly laid out. This makes it easier to meet their expectations, gain confidence in the service provided and helps the designer focus on creating a great brand design for you. So before you start any creative design you need to get to the core of your brand – that starts with knowing your company, who your ideal customers are and your closest competitors. As part of my brand design services, I offer three fixed-price packages based on business needs – each includes a comprehensive Brand Roadmapping Worksheet that we work through before starting any design or strategy session. 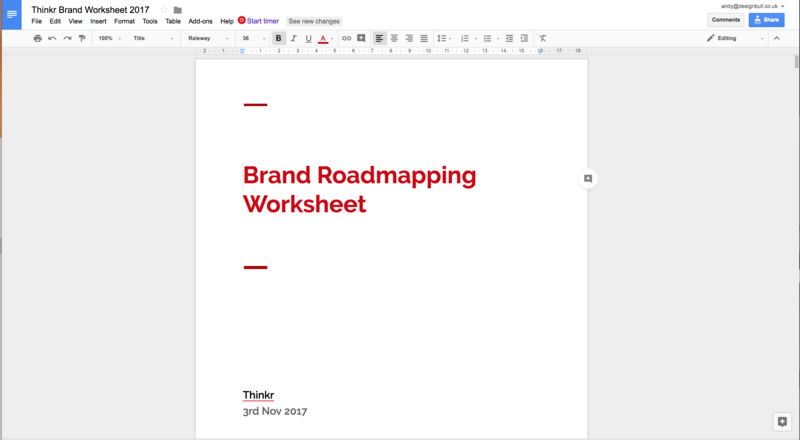 The Brand Roadmapping Worksheet is customised to each client and is designed and set up in Google Docs. I then send the client a link so that they can edit and add to their worksheet, and save it all in one place online. It is divided into 8 steps, from defining a company, its customers and competitors through to creating a 60-second pitch and visual mood board. 1. What are your brand goals? The goal isn’t to brand your business for the here and now; we’re branding your business to get you where you want to be 3-5 years from now. We need to know what your goals are in order to create a brand that helps you reach them. So what will success look like in 1 year and 5 years time? 2. Tell us about your Company? We go into the background of your company, how you started, what’s the story behind the name? What is the product or service? 3. What is your ‘60 second summary’? I use a great online exercise here by Neville Medora to help a client with their 60 seconds. A 60-second summary is a short description to explain yourself, your business, your goals and your passions. It tells others what you do, who you help, and how you help them. This will also help in writing your website content. Customers use services and products as they provide an answer to an unrealised aspiration. like, becoming independent and having others perceive you as such, or leading a less stressful lifestyle; relaxing to finding safety and stability or enacting a new role or position in life. In this section, we delve into creating a customer persona through the use of a Brand Story. Knowing who your competitors are in your industry will help you clarify your brand strengths and how you can take advantage of their weaknesses and stand out. Now that you’ve written your 60-second summary and outlined your ideal client/customer, choose 10 adjectives that best describe your brand. They should fit in well with your 60-second summary and appeal to your ideal audience. Decide if your tone should be short and witty, casual and inviting, or slightly sarcastic. Details like this can go a long way in differentiating your brand and business from those around you. Describe your brand’s tone of voice and make a list of more keywords and terms that you can consistently use. I set up a private board on Pinterest for my clients as it is a handy tool for rounding up visual inspiration online for your brand. So use it to your advantage by filling it with images that accurately represent your brand. Once it’s completed, I’ll schedule a get together with the client and go through everything in the worksheet. Then I’ll compile it into a PDF report that outlines the ideas and expectations, customer profile, mood board elements, and how it all comes together. It’s really important to go through these steps and answer all the questions in as much detail as possible. If done right it can form the basis of a strong brand, making you stand out from your competitors and bring a level of authenticity that builds trust with your customers. Want to make your brand the best it can be? Want a more effective logo? I can help shape your brand and elevate your logo to portray your business more effectively. Contact me to get started or learn more about how I build and launch brands. This entry was posted in Design and tagged brand, logo design, worksheet.